I got some exciting news this week: The Apocalypse – a short film by Andrew Zuchero, which I sound-designed and mixed – will be premiering at Sundance in January! It was such a fun project to work on, and I think it turned out truly great… I’m very happy about this. “Four uninspired friends try to come up with a terrific idea for how to spend their Saturday afternoon”, starring Martin Starr from Party Down and Freaks and Geeks and Ella Rae Peck of Gossip Girl fame. The love for Light Up Gold by Parquet Courts continues to pour in! Time Magazine just named the opener “Master of My Craft” its #5 song of the year (better than Skrillex, almost as good as Taylor Swift). Stereogum has gotten behind it too, premiering the titular track and ranking the LP as the 49th Best Album of the Year. NICE! What’s Your Rupture is re-releasing Light Up Gold (on CD as well) just in time for their tour this winter (check out their site for details). Since their signing, I’ve had the opportunity to work with Kevin, the owner of WYR and all-around cool guy. One project he brought me on board for is a restoration of a recording by Brett Smiley. I was unfamiliar with who this was, but Kevin schooled me pretty quickly – teenage glam heart-throb who worked with Del Shannon and then Andrew Loog Oldham, recorded a LP, then had it shelved for 30 years. The album Breathlessly Brett was finally released in 2004, but these tapes are from before then, when Brett was working with Del Shannon (of Runaway fame). It features 5 recordings done with Shannon (3 of which are previously unreleased) and some unheard demos…. needless to say, it’s been a cool project to work on. Another recording to recently resurface is the original Hindu Windmills by Elephant Micah. Joe O’Connell (E.M.) and I recorded this eight(!) years ago, late at night in a performance hall on the Northwestern campus, while we were working on the Mittens on Strings album Look Up the Sky!! (another album worth revisiting). Joe wasn’t thrilled with his performances, and as we were discussing what to do with them, a mutual friend accidentally leaked the mixes, which quickly spread across the Internet. In response, Joe re-recorded the songs himself, which were released a couple years later on Time Lag. As the years have passed and water has flowed under the bridges, Joe decided to put our sessions online for posterity. I found the original mixes, did a quick remaster, and they are now available online for a donation as the Hindu Windmills: First Sessions. I have to say that while I can hear the tiredness at times, and that I will always be disappointed that these songs leaked the way they did, I’m really pleased to have them properly out in the world now – they’re great recordings of wonderful songs. 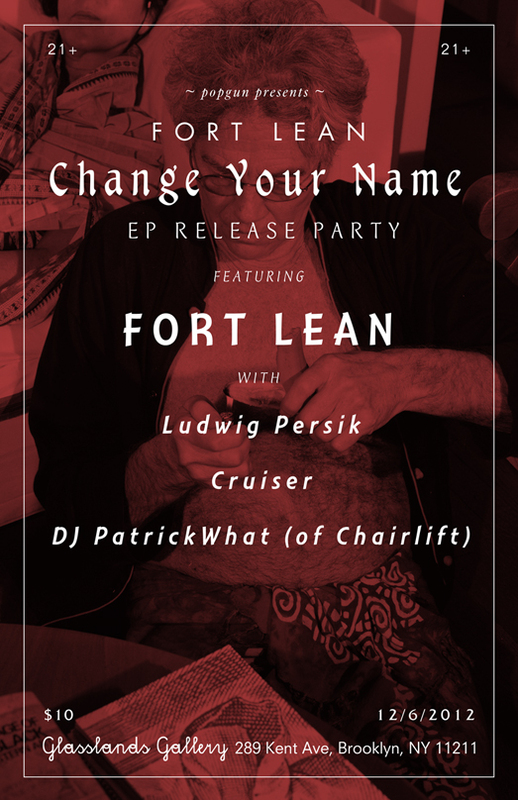 If you’re free tonight and around the NYC area, come to Glasslands to celebrate the release of Fort Lean’s new EP Change Your Name, and see why the New York Times recently gushed: “Three or four decades ago, Fort Lean would have been a mainstream success spawning emulators. Nowadays it’s a one of one, not that anyone should bother trying to compete.” Patrick from Chairlift (who produced the EP) will be DJing, and Ludwig Persik (who recently released an awesome self-titled EP) and Cruiser open. Previous ArticleDudes, I’ve Been Busy! !